THREE YEARS AS A MEMBER OF THE SECRET RECIPE CLUB! Last Monday of the month. You probably expect me to whine about the cold, but guess what? As you read this post, I should be far, far away in Brazil, enjoying balmy temperatures, wearing shorts, t-shirts, and recharging my batteries to face the frigid months ahead. But the last Monday means fun, because it’s Reveal Day for The Secret Recipe Club! I was paired with the blog “A Day in the Life on the Farm“, hosted by Wendy. Her story is fascinating: she and her husband were police officers in a large city (which of course meant a ton of trouble in their hands…), but when they retired they moved to a tiny little town of 4,000 people, and bought a house on 12 acres of land. They raise meat chickens, turkeys, and pigs, and Wendy – to fight her empty nest syndrome – decided to host foreign students in their place. Now she works part-time for the World Heritage, placing students into homes for a year of schooling here in the US. Being in academia and therefore often exposed to the troubles that foreign students face (plus, I was one myself), I know how important this type of work can be. Please, stop by her about page and read more about their life on the farm, and how on top of everything she also takes care of her Mom, who suffers from Alzheimer’s. She actually devotes a section in her blog to talk about it, under Life with Mom. Beautiful, touching, and at times funny. We had so much going on this past month, that I needed to jump on my assignment right away. The recipe I set my eyes on was a drool-inducing dessert, a Caramelized Almond Apple Upside Down Cake. But, I decided against it. Why? With Thanksgiving saying hello, then the holidays, a lot of heavy food will be popping everywhere. I did not want to start early with the excesses, so this cake shall wait. Sorry, folks, but better safe than sorry. Then, I almost went with her cute Pretzel Dogs. Finally it was a tough decision between Zucchini Enchiladas, or Green Rice. As you can see, I went green. 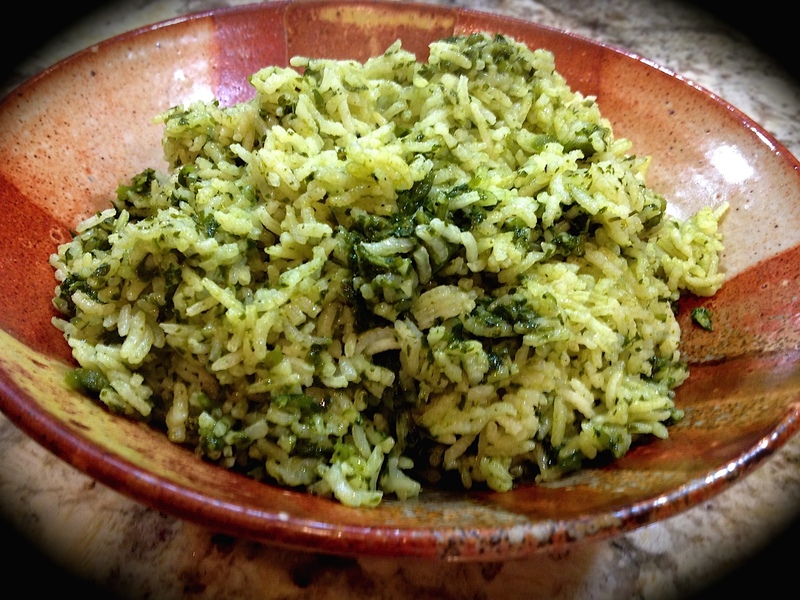 Green is good for you, and this was one of the most flavorful rice dishes I’ve made. Put the rice in a heat proof bowl, pour in boiling water to cover and let stand 20 minutes. Drain the rice, rinse well under cold water and drain again. Remove the peppers from the bag and peel off the skins. Remove any stems, then slit the peppers and scrape out seeds with a sharp knife. Put the peppers in a food processor, strip the leaves from the cilantro and parsley and add to peppers. Pour in half the chicken stock and process until smooth. Add remaining stock and puree again. Heat oil in a saucepan, add the rice and minced shallot and fry for 5 minutes over med heat until the rice is golden and the shallot is translucent. Add the salt, stir in the green puree, lower heat, cover and cook for 25-30 minutes or until all the liquid is absorbed and the rice is just tender. Taste and adjust seasoning, if needed. Comments: Lately I’ve been quite smitten with poblano peppers. Very little heat, but so much flavor! Our stove did a great job charring them, I don’t think I was ever able to get such a beautiful blackened skin with almost no effort. Using a paper towel to remove the charred skin was also a great move, a tip I got from watching Marcela Valladolid in her show Mexican Made Easy. I never liked the idea of rinsing the peppers because there’s quite a bit of flavor loss if you do that. The paper towels removed just the skin and I could leave little bits here and there for an extra smoky flavor. Aren’t they cute? Adding boiling water to the rice and waiting for 20 minutes was also something I had never done, and I liked the texture of the finished product. If you are a cilantro-hater, this rice is not for you, its flavor is obviously very prominent. You could substitute spinach. This was a delicious dinner! 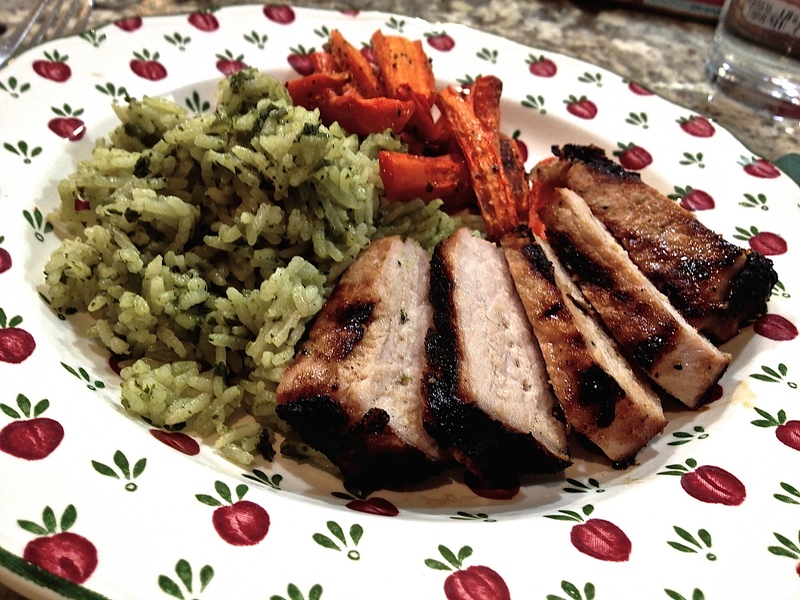 Green rice, simple roasted carrots, and for our protein a few slices of center-cut pork chops, cooked sous-vide, and finished off on the grill. Life is good! For my readers: if you want to see what my fellow Secret Friends cooked up this month, give a little click on the blue frog at the end of this post. Normally Groups C and D would take a break in the month of December, but apparently me and Dorothy from Shockingly Delicious whined so much about withdrawal syndrome, that The Secret Recipe Club will have a little surprise reserved for both groups. It will be awesome, so stay tuned! « GOING SKINNY AND LOVING IT! This rice sounds amazing! I never do fun things to rice when I serve it as a side – I really should green-it-up! This is exactly the kind of rice I like best, Sally. Great pick! And what a lovely tribute to Wendy. I’m going to her site right now. My mom had Alzheimer’s, and my heart goes out to anyone going down that particular road. I have many friends struggling with parents who have Alzheimer’s – such a terrible disease…. Sounds so good Sally!! So spicy! Great choice. BTW, you have sous vide? Jealous!! The combination of fresh herbs and roasted peppers sounds delicious. I used to be a cilantro hater but obviously my taste buds have changed cause now I love it. I wonder if there are different varieties of cilantro … the one from the regular grocery store that I tried about 20 yrs ago tasted and smelled like perfumed soap. The stuff I’ve been buying from the Thai/Viet grocery store (and it IS cilantro not parsley since they sell both) is much milder?? I can just see my husband’s face if I said we were having green rice for dinner. Of course if I showed him the recipe he would be all for roasting peppers. Great pick! Thank you so much for your kind words. I am so glad you liked the rice. You are right it has a very strong cilantro flavor and I think your suggestion about using spinach is a great idea. I agree – greens are where it’s at! This rice looks fabulous. Great post as always – excited about December 🙂 Happy Reveal Day, Sally! This looks delicious! I love love love roasted poblano peppers. You and me both! My favorite pepper these days…. I love the smell of cilantro, and to me it brightens up any dish. Good thing Phil loves it too…. this recipe and your pictures make me miss having a gas range! This rice looks so yummy! Great pick! That’s so cool how you roasted the peppers! Hello there! Great to see you here, and of course, you picked one of my favorite recipes… I must make that again, we loved it! How sweet of you, Stephanie! Sorry it took me so long to answer the comments this time, but I just came back from my trip… a lot of catching up as far as blogging in concerned…. 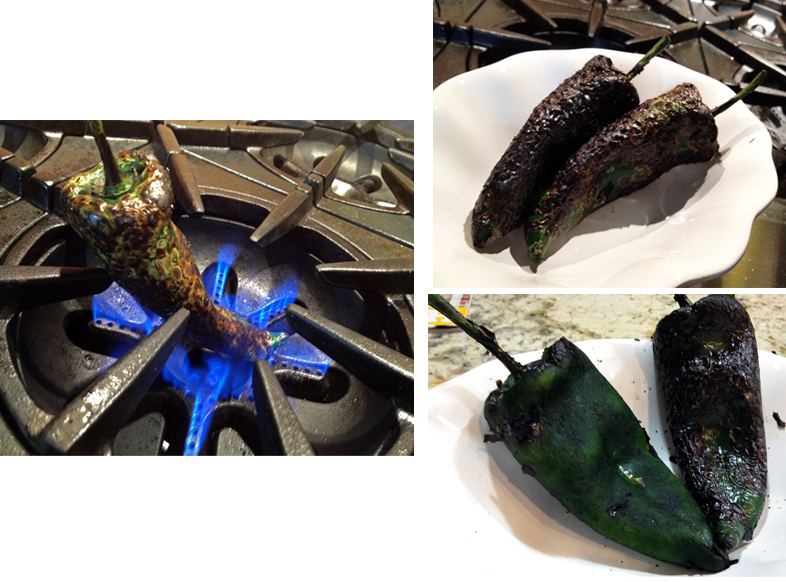 I love roasting poblano peppers! Just did yesterday for a beef stew. I must try this green rice for sure!! I looove cilantro! This looks like such an awesome sidedish. Great SRC choice! Really have to try it your way! have not put chillies into mine but it does sound moreish!! Do hope you are in Brazil by now and enjoying more summerish weather 🙂 ! Yum! This rice looks amazing! (It probably doesn’t help that I’m in the way home from work and needing dinner Haha) I’m impressed with that cooking method – never heard of it before! I was also intrigued by the method of cooking – the texture of the grains was very nice, I must remember this next time I make simple rice and see if it works too…. Poblano anything draws my attention, but this green rice sounds especially tasty. It’s on the menu tonight, and any leftovers will be the base for a Tex-Mex rice salad. Delicioso! That looks better than rice. I know it IS rice but it looks more like a casserole than a side of rice. Okay I think I’m not making sense but I love this green rice! I’m always looking for new things to do with rice….thank you. Also, the sous-vide pork looks amazing, don’t you just love your Anova?